Inferior ST depression occurs in leads II, III and aVF. It is important to look for reciprocal changes, e.g. in aVL, which suggest acute coronary occlusion. Once you know the lead directions, you can also group the leads into anatomical regions of the heart. These groups are useful because conditions like myocardial infarction may affect all of the leads in a particular group (e.g. an inferior infarct may affect the inferior leads of the ECG). Anterior leads include V3 and V4. Lateral leads include V5, V6, I and aVL. This ECG is from a man in his 40s who had an uncorrected Tetralogy of Fallot. Thrombus propagation on 10 serial Prehospital ECGs: Can you explain the progression? 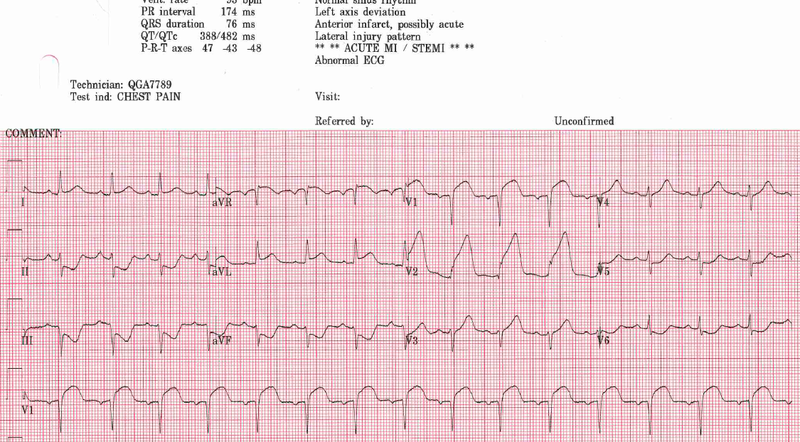 This ECG is from a patient of unknown age who presented with chest pain. This ECG is from a patient of unknown age who presented with chest pain. This was the repeat ECG 19 minutes later. This ECG is from a woman in her 50s who presented with palpitations for the last few hours. She had no known medical conditions and no regular medications. This ECG is from an elderly male who presented with chest pain. He has a pacemaker. This was his first prehospital ECG. 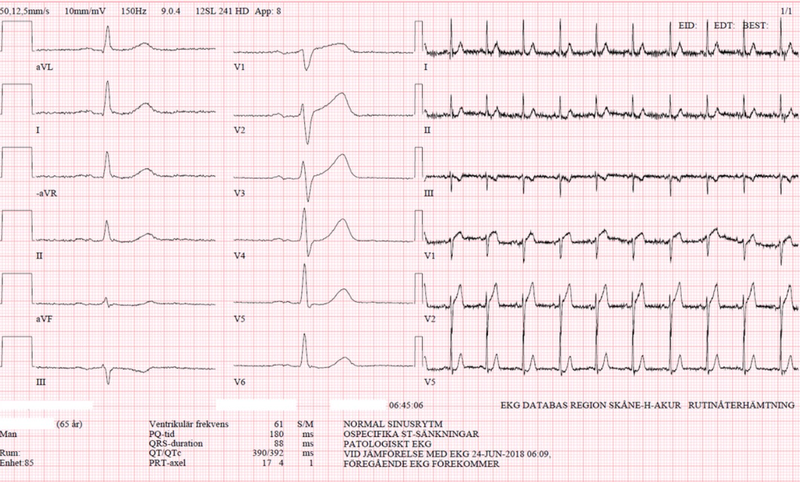 This ECG shows ventricular paced rhythm with concordant STE in aVR and concordant ST depression in II, III, aVF. The cause was most likely a proximal LAD or left main occlusion. This was missed and the patient died. This ECG is from a man in his 60s who presented with sudden central chest pressure with nausea. He had a history of previous infarction 15 years ago. This was his second ECG, taken 35 min after the first. This ECG is from a man in his 60s who presented with sudden central chest pressure with nausea. He had a history of previous infarction 15 years ago. This was his initial prehospital ECG. This ECG is from a middle aged man presented with tachycardia, leg oedema and a raised JVP. This was his initial ECG. This ECG is from a man in his 40s who presented with dyspnoea, hypotension and hypoxia. There was no chest pain. A chest xray showed diffuse pulmonary infiltrates, in a pattern consistent with pulmonary oedema. This ECG is from a woman in her 60s who presented with chest pain and feeling clammy, on a background of hypertension and high cholesterol. This ECG was recorded just before the patient had a VF arrest.